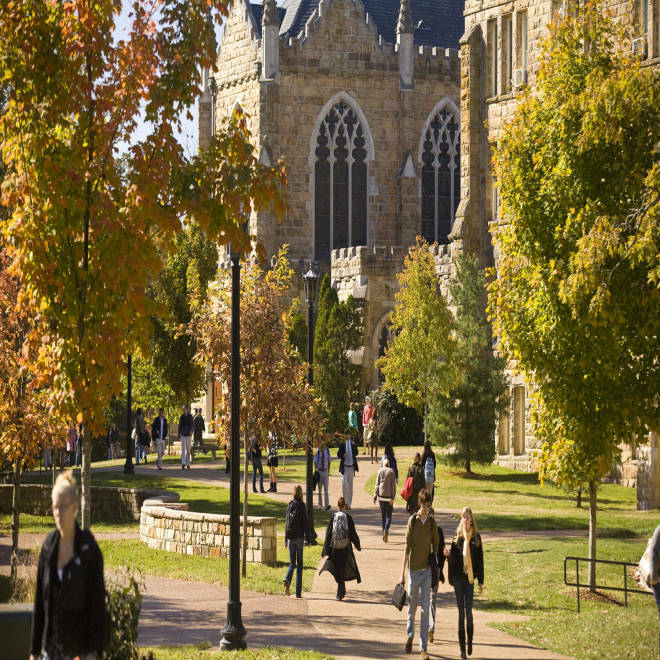 At a time when students and families are fed with up with rising college costs, University of the South in Sewanee, Tenn., cut tuition 10 percent last year and is promising to keep costs unchanged for entering freshmen for the next four years. As an undergraduate at the University of California–Irvine, Christopher Campbell was almost forced to drop out by repeated double-digit increases in tuition — some in the middle of the academic year — to compensate for massive state budget cuts. Campbell ultimately made it through and is starting law school at UCI this fall. But he watched classmates driven out of college by the unpredictable mid-year price hikes. Now he’s pushing an amendment to the California constitution that would ban public universities from raising tuition for students after they’ve enrolled. After three decades of tuition hikes that have outpaced inflation and increases in family income, students, families, legislators and governing boards are demanding a halt. “Enough is enough,” says Anne Mariucci, a member of the Arizona Board of Regents, which for the first time in 20 years has frozen in-state tuition at the University of Arizona and Arizona State University after increases over the last five years of 84 and 96 percent, respectively. Some private universities, too, have agreed to stop raising their tuition, or even cut it, after being alarmed to discover their enrollments starting to slip. How does South Korea outpace US in engineering degrees? “The pushback is beginning,” says John McCardell Jr., president of the University of the South in Sewanee, Tenn., which last year cut tuition 10 percent and this year is promising to keep the cost unchanged for entering freshmen for four years. Sewanee, as the university is known, was losing students to the University of Tennessee, the University of Georgia and other cheaper public institutions, McCardell says, and the size of the entering class was beginning to slide. Or with their votes. The Arizona regents were reportedly being pressed to get a handle on tuition by the governor and legislators. They, in turn, were hearing from increasingly angry constituents. “About time,” read the headline on an editorial in the ASU State Press, the student newspaper, when the tuition freeze was finally proposed. “As prices continue to go up, you have people saying, you can’t keep doing that,” says Rick Myers, chairman of the Arizona Board of Regents. The 10-campus University of California system also froze undergraduate tuition for this fall after the governor and legislature there made doing so a condition of a $125 million budget increase — though there’s a hitch: Tuition will increase more than 20 percent in the middle of the year if voters fail to approve a tax increase in November to raise $8.5 billion for public education and other services, a quid pro quo that some critics say is blackmail. Texas legislators have long pushed for a tuition freeze at that state’s public universities. When Gov. Rick Perry added his voice to the chorus this year, his appointees on the board of regents agreed — over university officials’ objections — to forgo a planned 5 percent increase over two years at the flagship University of Texas–Austin, where tuition now will be unchanged. Tuition also will be frozen at the Arlington campus. “It isn’t in the interest of most Texans for universities to be continually raising their tuition rates,” Perry was quoted as saying. Massachusetts Gov. Deval Patrick also announced that he opposed a 5 percent tuition increase at University of Massachusetts campuses, though the system’s board of trustees imposed it anyway. The only exception is the University of Massachusetts School of Law, which will hold tuition level. So will the law schools at the University of New Hampshire. Last year, the University of Maryland's Francis King Carey School of Law froze its tuition. Not coincidentally, the number of law-school applicants plummeted by more than 15 percent for the academic year that begins this fall — on top of declines of 10 percent in each of the previous two years — according to the Law School Admission Council. The number of students taking the Law School Admission Test this year suggests the trend will continue. Meanwhile, one third of law-school graduates in 2010 did not have jobs nine months later, and starting pay for those who did was down 13 percent. Phoebe Haddon, dean of the University of Maryland’s law school, cited “the impact of the economic downturn on the legal employment market” as one of her reasons for freezing tuition. Colleges and universities have long been reluctant to lower or cap their prices, McCardell says, because — as with new cars and fine wines — they believe students and their families equate price with prestige. That, he says, is why elite private colleges all magically end up within a few hundred dollars of one another each year. In his 25 years as a higher-education administrator, “I was reared to believe that what you charge is a reflection of your position in the marketplace,” McCardell says. “And I was reared to believe that no matter what happens, the American people will pay the sticker price. But all that changed fundamentally in 2008,” at the start of the economic downturn. Colleges that are especially feeling the squeeze are those with small enrollments and endowments — and those are also the kinds of private colleges and universities that are maintaining their tuition levels to remain competitive. Other schools that have frozen their tuition this fall include Burlington College in Vermont, which has about 200 undergraduates; Ancilla College, a Catholic, two-year liberal-arts college in Indiana with about 530 students; the 730-student Tabor College, a Mennonite school in Kansas; liberal-arts Urbana University in Ohio, which has 1,270 students; Franklin Pierce University in New Hampshire, which has 1,300 undergraduates; and Pacific Union College, a Seventh-Day Adventist college in California with an enrollment of 1,530. This fall, a few private colleges and universities — trying to compete with cheaper public institutions — are offering Costco-style markdowns. In New Jersey, for instance, private Seton Hall is matching the price of public Rutgers University for freshmen with top grades and SAT scores. That comes to about a 60 percent discount. Cabrini College, near Philadelphia, cut its tuition 12.5 percent and promised not to raise it above $30,000 through at least 2015. Lincoln College, a private two-year college in Illinois, lowered its tuition 24 percent and the University of Charleston in West Virginia 22 percent, both in response to declining enrollments. William Peace University, a women’s college with 700 students in North Carolina, slashed tuition nearly 8 percent to attract men as it becomes co-educational, and to increase its enrollment by 50 percent. And Duquesne University, in Pittsburgh, is responding to a big drop in applications to its school of education by giving 50 percent discounts to incoming freshmen. If students and their families are straying from expensive institutions, a few schools that are freezing or reducing what they charge seem to be winning them back. At Sewanee, applications have risen 17 percent, and the number of entering freshmen is up more than 12 percent. Oklahoma City University has 30 more freshmen enrolled this fall than last, and the number of students dropping out is down. Back in California, Christopher Campbell is juggling law school and his referendum campaign to keep tuition flat for students who enroll at the state’s public universities. This story, "Colleges freeze, reduce tuition as public balks at further price hikes," was produced by The Hechinger Report, a nonprofit, nonpartisan education-news outlet based at Teachers College, Columbia University.